The Balochistan University Partnership for summer 2017, run by the UMass Civic Initiative group at the Institute, came to a close on the UMass Amherst campus recently. The 15 business school students, from three Pakistan universities, have been studying entrepreneurship at UMass Amherst. The program’s final event was the final presentation of their business startup competition. Several weeks ago, the students were split in three groups, with each group tasked with creating a business. Each group then discussed, developed and implemented a business plan with startup funds of $100 each. 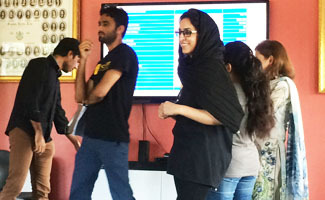 For the next several weeks the groups competed against each to make the most money with their startup ideas. 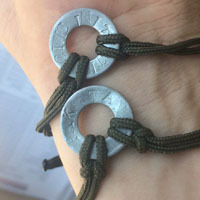 Handmade nylon and metal bracelets sold for $5/piece that could be personalized. Part of the proceeds earned were donated to Amherst Survival Center. Home-brewed, fresh yogurt drinks popular in Pakistan, called “lassi” that could be ordered online. Homemade Pakistani breakfast food including a pastry called “paratha” and cardamom tea, also ordered online. The startup presentation judges were Hassan Shahid, a Pakistan entrepreneur and UMass Civic Initiative alum; Becky Howland, UMass Civic Initiative Program Manager; and Arbab Naseebullah, lecturer, Balochistan University of Information Technology Engineering and Management Sciences. The presentations wrapped up the five-week entrepreneurship education program based at UMass Amherst that included training business simulation software (CapSim), academic coursework with education and business school faculty, guided blogging sessions and other on-campus activities. The group also traveled to several locations in western Massachusetts as well as New York City, Boston and Washington, DC. Earlier this summer, a group of faculty from the same universities took part in a five-week program focused on the pedagogy of teaching entrepreneurship with the goal of implementing this pedagogy in their home universities. The UMass Civic Initiative has also hosted other summer programs with participants from Argentina, Iraq and many other countries. A fall program of 20 young leaders from southeast Asia will start in September. A 2016 article on the southeast Asian program can be found here.